The complete solution to a wire free professional installation, bringing you professional quality at an affordable price, We are currently offering to supply the Visonics Complete kit, Express kit and Amber, the prices and specification are outlined below, all installations come with two year’s parts warranty and one year’s aftercare, unless otherwise stated. The power max express has all the features of the power max range, but has an in built GSM dialler so no need for a phone line just plug in a mobile phone sim card and you’re ready to go! Comes fully fitted, two years parts warranty and 1 years aftercare. 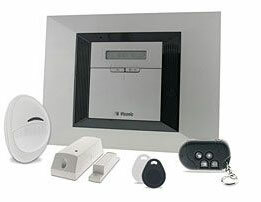 Powermax Pro is an all-in-one wireless security system that brings an entirely new level of versatility, connectivity and style to the world of home security. It lets homeowners view and control their homes from anywhere via any web browser or mobile phone, delivering ease of use and reliability, in an elegant, contemporary design. The powermax pro intelligent, professional grade architecture delivers exceptionally robust performance, starting with a fast and easy installation and setup. 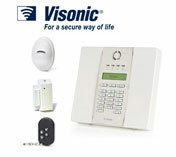 With its built-in PSTN communicator and x-10 home control interface, and the ability to add internal GSM/GPRS or Broadband IP* communications modules, it offers users and installers outstanding flexibility: homeowners can select the security system that matches their requirements and budget; and service providers gain the perfect platform for offering web-based security solutions. 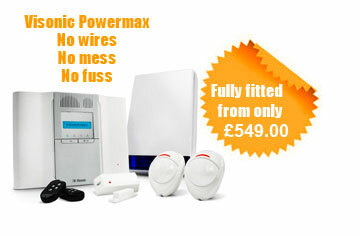 Adding the unique internal powerlink module turns powermax pro into a fully managed web-based security and home control solution. This solution includes real-time camera surveillance and home control, alarm time image verification, mobile phone and email event notifications, and much more. Homeowners can be logged in to the system via any web browser. Protect your elderly loved ones with a product that lets you be there whenever your needed at the touch of a button, the system will call you in an emergency and you can speak and check on their safety. Ultra-modern and streamlined design fits any décor. Programmable inactivity monitoring and fall monitoring via a wearable detector. Comprehensive environmental safety detection – including, smoke, flood, carbon monoxide (CO), and intrusion monitoring. Emergency call initiation and pick-up of incoming calls using wearable remote transmitters. Up to 16 customizable reminders (voice messages and on the LCD display). Large LCD screen with unlimited language options, and time and date display. Local and remote programming via PC or telephone line. Comprehensive anti-failure protection features – including power failure and low or missing battery alerts, 24-hour backup battery, and programmable periodic test.